What a find~! Congrats, ZV – I know how hard you work at these things! Nicely done…. Thank you – even after going on a photo walk today in 90+ heat, I didn’t have to come home and wash it all off. Still going high and dry! Like the man said … ‘ Always wear sunscreen ‘. That is all I’m going to say on the subject. 90+ heat is not something that we get ever in Ayrshire … but the sun does venture out on occasion. In fact … it is shining at this very moment ( although by the time I’ve finished it may well not be ) ….. Looks outside ….. still SHINING!!! Zoe … can you do me just a wee favour … would you subscribe to my site at http://www.the1951club.org PLEASE. It is a wordpress site by the way so I’d be very grateful as I could do with all the hits I can get. Great post, Zoe! I have used a variety of Clinique products over the years and totally had the same experience with the whole basic “system” of toner/cleanser/dramatically diff. moisturizer to which one is first introduced. I have a friend from grade school who has been using that system since our freshman year in high school and loving it. She’s the only one I’ve ever met who feels that way! 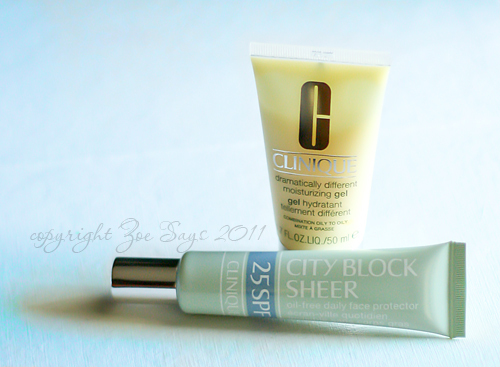 I loved city block when it first came out. I also like their pore minimizer, which was slightly tinted and had that mattifying feel. I have since graduated to old lady skin (i.e., moving from combo and sensitive to dry and extremely sensitive) so I have changed over to Olay Pro X which is awesome for my needs (and comparatively cheap), but you describe perfectly the feeling of elation one has when one finds the moisturizer that actually suits one’s needs. Hurrah! I can’t believe it’s taken you this long to be a Clinique moisturizer convert! The dramatically different moisturizer is the best thing ever. How did I never hook you on to it in our college years? Zoeeee! I have NO idea. Clearly I blocked it out because even now I’m thinking to myself, “You use that?” I know you have been a devout user of the facial soap but for some reason, that yellow bottle is not surfacing in my mind’s eye. But you were ahead of the game and now I’m right there with you. Total convert!